TALLAHASSEE | The Arizona Wildcats' defense was atrocious - ranked well below 100 - when Mark Stoops took over as defensive coordinator in 2004. 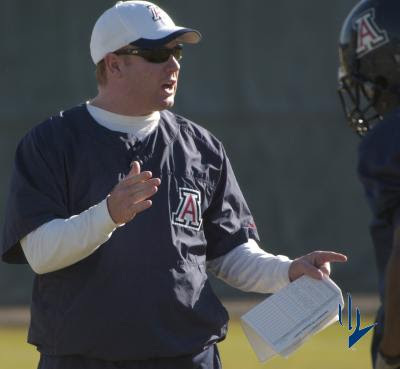 Along with his brother, Arizona coach Mike Stoops, Mark helped turn the Wildcats into one of the nation's top 25 defenses. "Where we came in, it was a very difficult situation, one of the worst in college football," Stoops said. "It didn't happen as fast as we'd have liked, but (we're) very pleased with where the program is right now." Stoops finds himself in another difficult situation this season as Florida State's defensive coordinator. The Seminoles were 108th in total defense in 2009. Arizona, by comparison, was 25th. The 42-year-old Stoops said FSU fans will see some differences from what Mickey Andrews did for the past 26 seasons. Stoops said FSU will retain its 4-3 defense but emphasized that it will offer "multiple" looks. "I think the biggest change that you will see is that there will be a difference in some zone coverages," Stoops said. "They will be more multiple on the back end, and we will play some man and some zone, but we will mix it up. "We will attack, but in the Pac-10 with Arizona, we led the conference in sacks, and I wouldn't say we are an overly aggressive blitzing control defense. I think we are very precise." Precision was missing last season as the Seminoles allowed 30 points per game, missing tackles and giving up big plays that contributed to a 7-6 record. Andrews retired in November, and coach Bobby Bowden was forced to retire a few weeks later. New coach Jimbo Fisher has overhauled the staff, bringing in five new assistant coaches. The defensive staff, with the exception of Bartow native Odell Haggins, is new to FSU but familiar to Stoops. "What a phenomenal class act. Tremendous worker and great knowledge," Stoops said of Haggins, calling him "Mr. FSU." Stoops said leaving Arizona was a tough decision but that he wanted to return to coach in Florida, was intrigued by FSU's tradition and had a desire to work with Fisher, whom he had formed a friendship with on the recruiting trail a decade ago. "It's a blank canvas," Stoops said. "We're going to start fresh." Stoops did just that at Arizona. Before that, he spent the 2001-03 seasons at Miami (going 3-0 against FSU). He coached a Hurricanes secondary that was loaded with future NFL stars, including Ed Reed, Sean Taylor and Antrel Rolle. Stoops returned to the Sunshine State less than three months ago and hit the ground running with recruiting. While he's focused on the future, he emphasized his respect for the past when referencing his recent meetings with Andrews. "I love just visiting with him, talking about things, and having him around our players," Stoops said. "I hope he stops by and is a presence around here." Stoops said he is humbled to be replacing Andrews. "It's very big shoes to fill," Stoops said. "He's a legend in my eyes."